FDA pharmaceutical approvals in recent years, particularly in 2007, have noticeably decreased. Typically, coverage of declining FDA approvals has concentrated on pharmaceuticals in general or those regulated as drugs. This article reviews 2006 and 2007 approvals of new biopharmaceutical treatments and notes some disturbing trends. These include fewer drugs given the green light in recent years and particularly in 2007, a lower level of novelty as well as healthcare and economic impact. If the low number of approvals, their novelty, and their impact remain at last year’s levels, the industry is in big trouble. It remains unclear who, if anyone, deserves the blame. There is hope for a turnaround in the near future, however, as we appear to be near the end of or coming out of a low period. 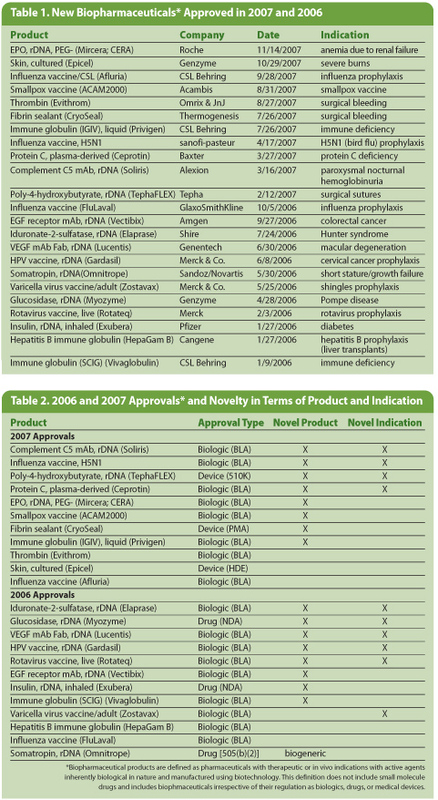 New biopharma products that received original FDA approval in 2006 and 2007 are shown in Table 1. This information is derived from “Biopharmaceutical Products in the U.S. and European Markets,” a reference book/database concerning biopharmaceutical products. In this article, biopharmaceuticals are defined as pharmaceuticals with therapeutic or in vivo indications with active agents inherently biological in nature and manufactured using biotechnology (living organisms). This definition does not include small molecule drugs but includes biopharmaceuticals irrespective of their regulation as biologics, drugs, or medical devices. The numbers of new biopharmaceuticals approved in 2007 and 2006 were on the low side, just 11 and 10 respectively. Last year was particularly notable for what was missing: novelty in terms of active agents and products that will significantly affect the market. None of the 2007 products are expected to achieve blockbuster sales or significantly improve healthcare for a large number of patients. Also in 2007, other than a formal approval for Epicel, a product that has been on the market for 20 years, no product from an U.S. biotech firm received an FDA go-ahead. In 2007, approvals were granted primarily to large foreign and small U.S. biotech-type companies. In contrast, 2006 approvals included more novelty and impact. For example, there were more new recombinant proteins, products expected to achieve blockbuster sales, and therapies that would significantly impact heathcare and public health. Most of the 2007 approvals were incremental advances, me-too products, and those with rather specialized indications. These included a recombinant mAb (Soliris) for an orphan indication with sales projected to peak at $500 million a year; Mircera, a next-generation modified erythropoietin with blockbuster-sales potential but with patents blocking its entry into the U.S. market; Epicel, cultured skin that in all likelihood will be used by less than 100 patients/year; a prepandemic bird flu vaccine and a cell-cultured smallpox vaccine, both purchased by the government and not sold commercially; yet another standard influenza vaccine; various incremental advances in blood products (more fibrin glues and an immune globulin); Ceprotin, the first blood-derived protein C product for an orphan indication; and TephaFlex, recombinant-manufactured plastic sutures. The 2007 product with by far the most market potential is Roche’s (www. roche.com) Mircera, which will probably not be sold in the U.S. for at least several years due to patent infringement issues. If Roche does prevail in its patent dispute with Amgen, which currently seems doubtful, Mircera will compete against Amgen’s erythropoietin products. This will thus break the company’s monopoly and secure Mircera’s position as the most important treatment with the greatest sales potential approved last year. Presuming that Mircera remains barred from launch in the U.S., the projected peak sales for all 2007-approved products combined do not reach blockbuster status, which is defined as sales of $1 billion per year. If this lack of major products carries over into upcoming years, the industry is in big trouble. In contrast with the last year, 2006 approvals included products that are expected to have a broader impact on healthcare and the market. This includes Gardasil, a vaccine for the prevention of diseases caused by HPV such as cervical cancer, that has already achieved blockbuster sales; Vectibix, which provides an alternative to Erbitux for treatment of colorectal cancer and is expected to eventually attain near-blockbuster sales; Lucentis from Genentech, a significant advanced treatment for macular degeneration with near-blockbuster sales expected (presuming off-label use of Genentech’s Avastin do not cannibalize its sales); and two new vaccines—Zostavax for adult prevention of shingles and Rotateq, a pediatric rotavirus vaccine. FDA approvals of new biopharmaceuticals from 1981–2007 are shown in the Figure. A record year was 2005, with 21 biopharmaceuticals receiving the green light. Between 1996 and 2005, there was an average of 16.6 approvals per year. The relatively low number of biopharmaceutical approvals in 2006–2007 parallels the low number of overall new pharmaceuticals approved in 2007 and recent years. The low approval numbers are of particular concern, because a number of products have been in the pipeline. This includes plenty of biopharmaceuticals that entered clinical trials from the mid-1990s to mid-2000s, a period expected to result in approvals during recent years. For example, the Pharmaceutical Research and Manufacturers Association (PhRMA) reported 350 biotech medicines in development in 2000, most in earlier stages. The declining number of recent approvals is often attributed to unnecessary delays and denials by FDA. For example, various high-profile therapeutics received approvable letters in 2007 and multiple product evaluations were delayed or their applications denied. Some analysts and company executives believe that controversies over the safety of Vioxx and other pharmaceuticals have stung FDA. As a result, the agency is being overly cautious, defensive, and unassertive. Some have noted that FDA is taking a longer time and/or inducing delays in approvals of new products including those with indications similar to already available drug in addition to stalling or denying supplemental approvals for new indications. However, relatively few filings for biopharmaceuticals have been arbitrarily denied or without some seemingly valid reason, significantly delayed, or put on long-term hold. There usually has been some obvious problems with the filings, often related to trial protocols and/or products not attaining their preset primary endpoints in pivotal trials. High-profile examples include FDA refusing to approve Provenge, an immunotherapeutic prostate cancer vaccine from Dendreon, despite a positive recommendation from its own review committee. The agency also refused Genasense, an antisense drug for relapsed or refractory chronic lymphocytic leukemia from Genta. The decrease in approvals, however, could be linked to the fact that the FDA has subtly shifted, or is adjusting its standards to be stricter or more restrictive in terms of efficacy and safety. Alternatively, it may simply be doing its job more slowly, with inadequate staff and resources taking its toll. Or, it could well be the result of poor decisions and execution by sponsors, including inadequate trials. The low number of recent biopharmaceutical approvals is probably not due to fewer products in development—pipeline databases and other sources generally show that the number and percentage of biopharmaceuticals vs. other pharmaceuticals have been steadily increasing. Rather, it appears that fewer products are making it through pivotal Phase III trials. Most biopharmaceutical filings receive priority review. Sections are filed as completed, often with pivotal trial results being the last part to be filed. As a result, related delays and denials are more dramatic compared to the sponsors never filing or FDA refusing to file a full application with completed pivotal trial results. FDA may well be subtly shifting its approval criteria regarding safety and efficacy, but most of the biopharmaceuticals affected had problems, usually showing insufficient efficacy and safety in pivotal trials. It appears premature to blame FDA for systematically, needlessly, or arbitrarily delaying or denying approval of biopharmaceuticals. About two dozen filings for biopharmaceuticals are currently pending at FDA and about two dozen more are expected in 2008. Thus, unless the great majority of pending and upcoming applications are rejected, delayed, or abandoned, an increase in approvals can be expected in 2008 and 2009. If this proves to be the case, FDA approvals of biopharmaceuticals appear to be on a three- to five-year cycle. Thus, we are now probably in or near the end of a trough. In this article, new biopharmaceutical entities (NBEs) are defined as products with active agents that have novel structures or sources and also those with substantially novel formulations. The criteria for determing NBE and novelty status are not the same. A product can be an NBE, be new and unique, but not novel. Of the 11 drugs approved in 2007 and 12 in 2006, 10 in each year were NBEs. These include all but Afluria and FluLaval, which are essentially biogeneric versions of prior influenza vaccines, and Omnitrope, the seventh recombinant somatropin product appproved by FDA. That NBEs make up such a high percentage of the approved biopharmaceuticals is not surprising. The reverse is true though with small molecule drugs, where a much smaller proportion of original approvals are for novel molecular entities for which multiple routes for generic/abbreviated approval are available. But NBEs have varying degrees of novelty in terms of active ingredients and indications. Most 2007 approvals were me-too products in which the active agents were similar in many respects to those in prior products and/or approval was received for the same indications as prior products. 2006 approvals were generally more novel in terms of active agents and indications. Table 2 lists 2007 and 2006 biopharmaceutical approvals and their relative novelty. The 2007 products with the most novelty from an entity- and indications-based perspective were Soliris, the H5N1 influenza vaccine, TephaFLEX, and Ceprotin. The other 2007 products have some caveats or limitations regarding their novelty. The number of new recombinant protein products, currently totalling 106, approved from 1981–2007. These approvals generally follow those of all biopharmaceuticals. Recombinant protein approvals peaked in 1997 at 12. 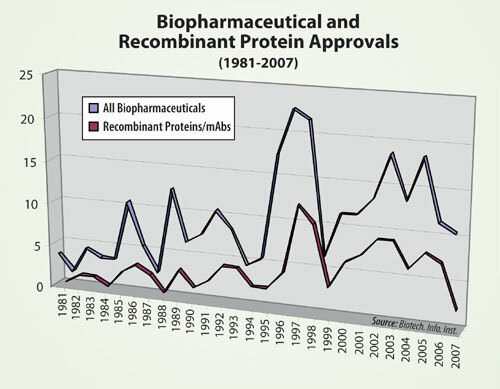 The two approvals of recombinant proteins in 2007 are more typical of the number of approvals granted in the 1980s. With a large number of biopharmaceuticals, particularly recombinant proteins and mAbs, in development in the past decade, this dearth of approvals is of particular concern. It has been reported that approvals of recombinant proteins including mAbs were increasing in the early 2000s, with time in clinical development typically about six to seven years. In the context of the large number of biopharmaceuticals in development in this time range, the approval of only two recombinant proteins in 2007 is distressing. Hopefully, this is an aberration. With about 12 applications for recombinant proteins currently pending and 12 or more projected to be filed in 2008, recombinant protein approvals may soon reach a more appropriate level. As in previous years, hardly any mAbs or cancer therapeutics were approved in 2007 despite seemingly endless hype about a large number in development. No biopharma therapies were approved for cancer indications in 2007, and only one was in 2006. In both 2006 and 2007, only one mAb received approval, both of them recombinant proteins. Few approvals were granted to estabished biopharmaceutical and U.S.-based companies in 2007. Among established U.S. biotech companies only Genzyme received approval for a biopharmaceutical (Epicel). Alexion, Tepha, and Thermogenesis were the only examples of classic smaller, R&D-intensive U.S.-based biotech firms to receive approvals in 2007. Baxter was the only U.S.-based large pharmaceutical company receiving an approval in 2007. This study confirms a low number of biopharmaceutical approvals in recent years, including recombinant proteins and monoclonal antibodies, with 2007 being a particularly unproductive year. The reasons for this and assignment of fault, if any, require further study and discussion. If biopharmaceutical approvals and their novelty and healthcare and economic impact remain at recent levels, the industry is headed for serious problems. and the author of Biopharmaceutical Products in the U.S. and European Markets. E-mail: biotech@biopharma.com.